signal 3: the blue lines are above the red lines. signal 4: set TP and SL. signal 5: if the price crosses the blue line , close it . signal 3: the red lines are above the blue lines. signal 5: if the price crosses the red line , close it . Please scroll down to see bonuses..
Is your resume helping you move forward or holding you back? Advance your career and never miss another career opportunity! Resume Maker Professional version 11 is packed with powerful features to help you write a better resume, land a better job, and earn a higher salary. Whether you're actively searching for a job or just want to get your resume in shape, trust your resume and your career to ResumeMaker. * Improved! Job Finder -- Search millions of job openings - faster than ever! Exclusive new features search up to 4 million jobs to narrow your search within a 50-mile radius or by career category. * Improved! Resume Caster -- Broadcast your resume to every major career Web site – instantly posting your resume to over 100 career Web sites! One simple form takes about five minutes to complete. Save 60 hours of research and data entry. Be seen by up to 1.5 million employers and recruiters daily. * New! Resume Wizards -- The new Resume Interviewer provides a personalized resume based on your career situation for better results. And, if you already know what you need, Resume Express helps you breeze through the resume-writing process. * New! Real Examples -- We work hard to keep up with the latest trends in resume writing. We've collected 750 of the most impressive, genuine resumes each written by professionally-certified writers. * New! Tools for Your Search -- Create a List of References and Resume Addendum for additional projects, training, skills, or papers and articles that will not fit on your resume. * New! 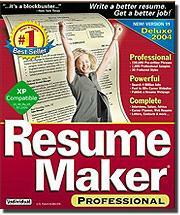 E-mail Resumes in Perfect Format -- Whether you are e-mailing your resume or exporting to Microsoft Word, ResumeMaker ensures your resume keeps its original professional style and format - regardless of hardware, software, or e-mail systems. Send properly formatted resumes without attachments and impress hiring employers. * New! Professional Resume Reviewer -- You only get one chance to make a first impression! ResumeMaker helps you review your resume and cover letters before sending them to employers. Avoid common mistakes and ensure that your documents reflect the professional in you. Over 50 checks ensure professional results. * New! Updated Salary Finder -- Salary Finder gives you a negotiating advantage with up-to-date salary figures for your career in your geographic location. Print a personalized salary report, negotiate with facts, and get paid what you're worth. This new, expanded edition of a classic bestseller supplements veteran career advisor William Montags years of experience with the powerful online resources of CareerJournal.com, The Wall Street Journals own career Web site. Let this handy resource be your own professional executive coach with up-to-the-minute advice on how to land your ideal executive job using proven high-visibility marketing techniques. The top-notch, real-world resume and cover letter samples inside will help you launch your search with the same competitive edge held by the top-level clients of Montag Associates. Youll learn how critical self-marketing is to your success and how to maximize your marketability by pairing the perfect cover letter with the right resume for any job opportunity. By combining the authors power packaging and patented Expansionist Theory™ methods with 24/7 online job search strategies you can outmarket, outsmart, and outclass the competition. Completely updated information on e-resumes, internet resumes, and scannable resumes, this is a giant compendium of before-and-after resume transformations and advice that’s hailed by professional resume writers as the definitve resource for writing and desigining resumes that get people noticed. It provides trade secrets of a professional resume writer to the person out there trying to put together the best possible resume when applying for the “ideal job position” they want to attain. "There is a lot of information in this small book, but it never loses focus on writing quick, strong letters." "We found this book to be very helpful and plan to utilize it in our job readiness program."